The Fabulous Ms. M.: STOP WASTING TIME! To my favorite magician... Your trick is wasted on me. Now, Some people don't care. I'm not some people. 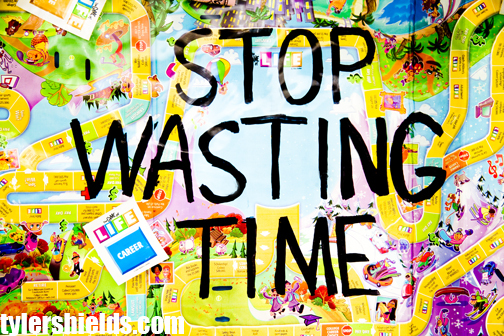 I care enough to tell you: stop wasting time by doing something that has no result. I adore and respect you as a person. Which is the highest complement I can give anyone because for the most part, I don't like most people. They never earn my respect. So darling, I'm telling you this as a person who cares but can not fall in love with you in any shape or form other than to love you as my brother in humanity: Please stop this behavior and love yourself more. It's really tacky. Kisses. For the rest of you... You are free everyday to continue living as you choose. You can elect to do something wasteful or you can do something fabulous with yourself. Just remember you do need to work for what you get in life. It's not always going to be handed to you. Free is fabulous but it doesn't always happen. Entitlement will not help you in the end. Here's an old story and soon there will be more stories... AGAIN! I have delightful news to share but I can not just yet. I do miss sharing writing with all of you lovelies. The stories have always been my favorite to produce but there has to be a better way. WHY? Because I enjoy you reading them for free and others feel strongly that I must charge. Who's right? I am. Of course! Don't you know anything yet! The last time. Like the ghost of the mind sent to haunt, I can remember it like it happened yesterday. So very strange, I can’t tell you what she was like, or the books she read, but I can remember the last time I saw her. In the dark shadow beneath the eave of the Eleventh Street Bridge, wrapped up in a light blue sweater with her brown hair gathered beneath a scarf, she was avoiding the rain. It was raining; a stormy afternoon under black and grey skies dropping a flood of water from the heavens. How do you like that? Somehow it’s always raining in the songs and movies. But this was real life rain. The drenching kind where you can’t seem to keep the clothes from sticking. Dripping through the cracks and falling to the ground in tiny rivers that run downward along the slanted street. There was no where safe from the wetness. My clothes cling in the most uncomfortable way as I move through the blanket of water. After crossing the wet pavement I reach her and she pulls me close for a kiss. A deep kiss, passionate enough to stop time for a single moment. This is goodbye. I have no choice as its death or this. Staying isn’t an option. There are unspeakable crimes in this world and I can’t begin to be sorry for mine as they will tear us apart. She asks me, “You love me don’t you?” Not waiting for my answer, she pulls out a knife. The kind you’d use to skin flesh from an animal after killing it. The knife caresses my cheek and catches the stubble of my newly grown beard. Tearing into my skin she pushes her interrogation further. “I’ll be your mirror. Take me with you?” Pushing her away, I can’t take her. I understand this demand. She won’t stop trying to save me from this life. Trying to be the mirror that reflects light to my darkness. I can only mirror darkness back into her. My heart can’t bear the thought of destroying something so pure. Small hands continue to struggle for a grip. Succeeding. Holding me tighter in a deep embrace. Angry sobs fall from her as she’s pressing against me. Pulling at my skin. Tearing at her skin, I make an attempt to break free. Screaming as her body wrenches back and recoils with pain. Retaliating she leaps forward and plunges the knife through the soft skin of my belly. Without regard, I remove the knife and thrust her away from me. Grappling to reach out to me again, her body slips. Downward she tumbles onto the sharp bloody knife. Almost as quickly I’m down after her. Lifting her back into my arms. Too late. The red slit deepens and spreads across her sweater. As the color blue fades into the crimson expanse I watch the life fall away from her. Our blood pools together silently landing in the flowing river of water. Holding back the tears I push the hair from her face and kiss her forehead. Tiny lips tremble with fear while the darkness comes. Mirroring my own darkness when she should be reflecting light. My delicate angel of light; falling into my life accidentally and leaving just as suddenly. In life she couldn’t never be my mirror, in death I can see the darkness reflected. The only thing I have of her is this memory of death. The last time we embraced death was consuming her. Remembering death is the most painful memento as it haunts more powerfully than the memory of her life.